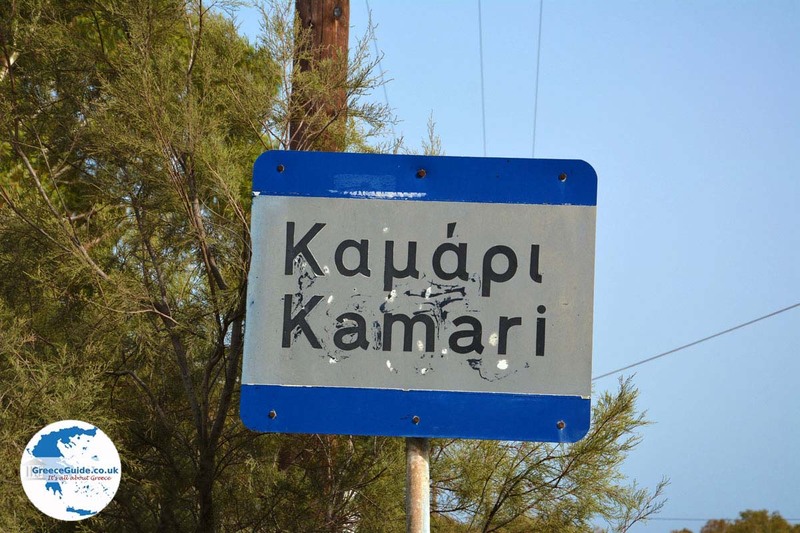 Kamari. Kamari is located east of Santorini's capital Fira and it is the busiest resort on the island. 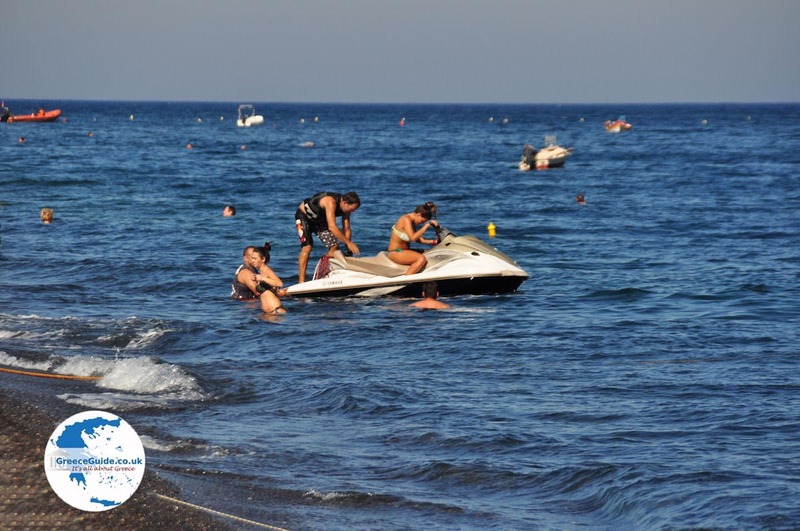 Kamari, which is situated right next to the mountain Mesavouno, has a long, black, sandy, pebble beach that stretches to the village of Monolithos (5 kilometers/3 mi). 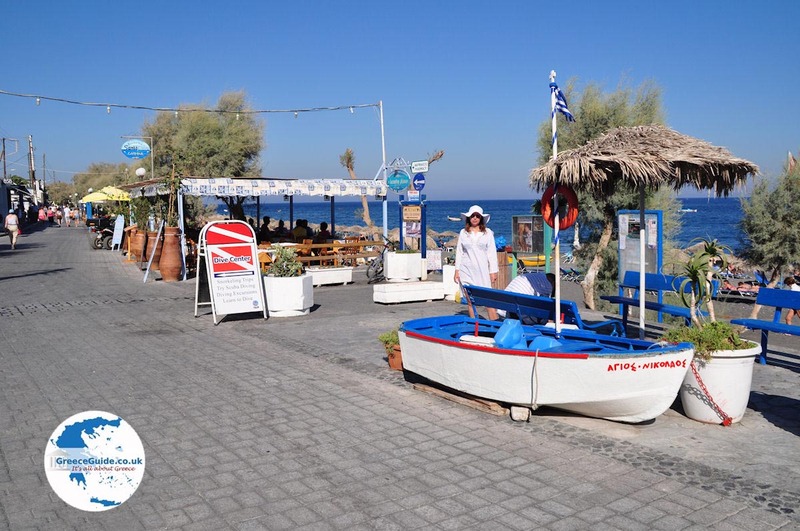 Tourists who enjoy the sunset in Fira, Imerovigli and Firostefani, come here during the day to sunbathe, swim and simply enjoy themselves at the beach. 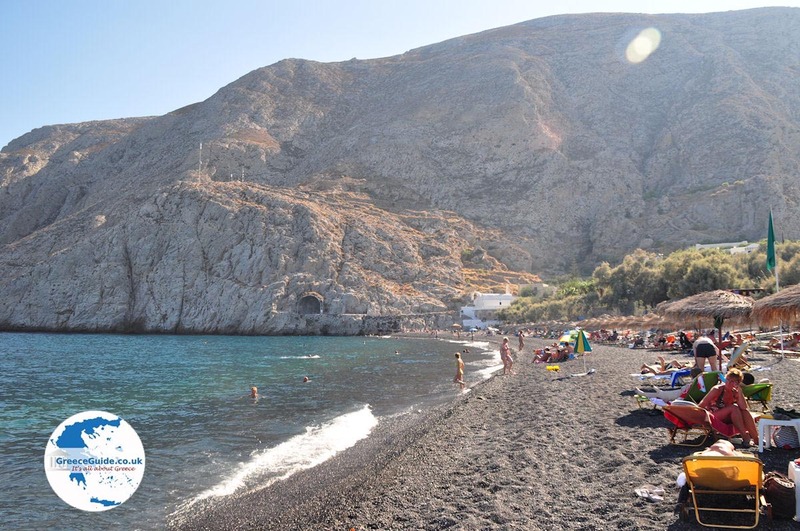 Kamari, situated just about 10 kilometers (6 mi) from the capital of Fira, has one of the most beautiful beaches on Santorini. 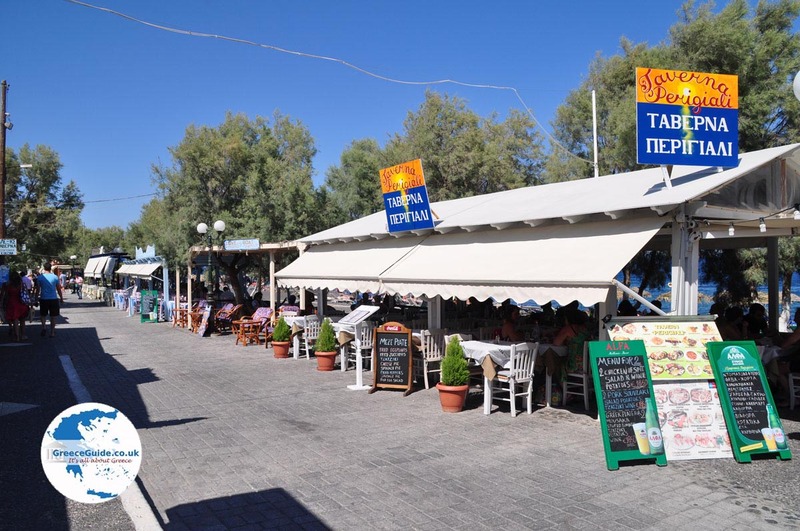 Along the coast there are plenty of restaurants, taverns, gyro-shops, bars, cafes and nightclubs. There are also souvenir shops, bakeries, pharmacies, etc. Since it is often breezy, this area is ideal for windsurfers. 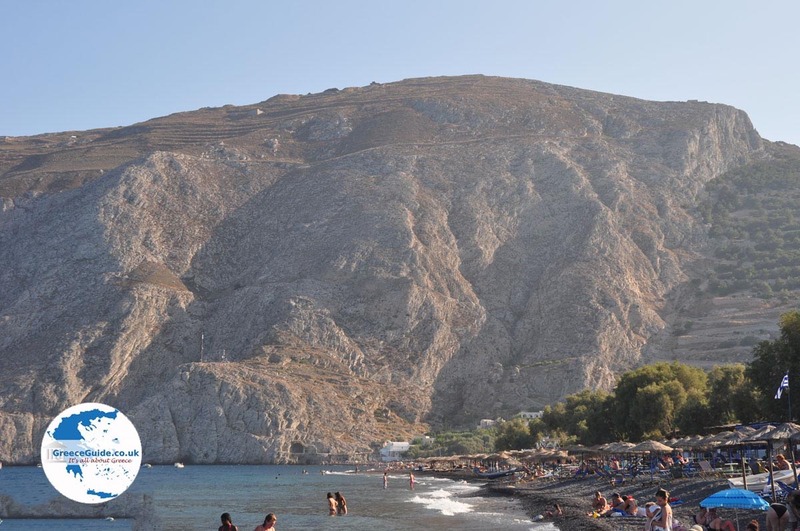 From Kamari, daily boat excursions make their way towards the island of Anafi, located opposite of here. Accommodations ranging from luxury hotels, to cheap rooms, apartments, and campsites are located in Kamari. 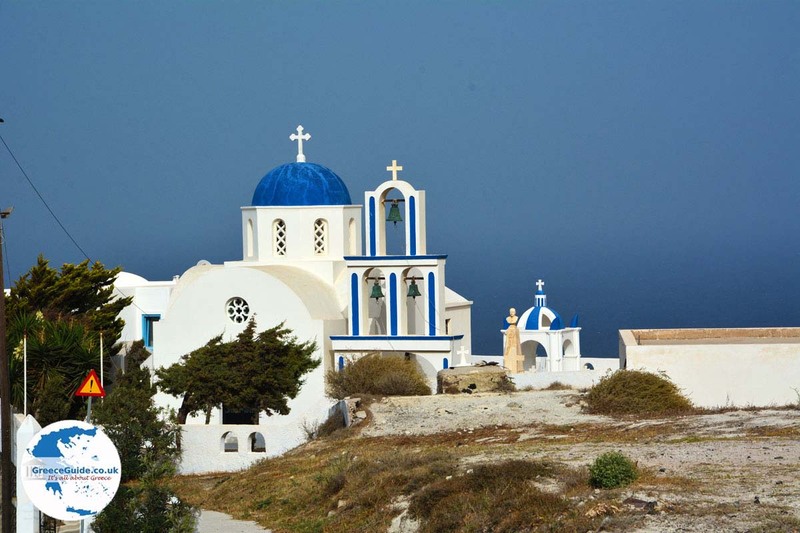 At Mesavouno are the ruins of Ancient Thira (400 meters/1,300 ft). If you are good walker, you can hike up and take beautiful pictures of the island. 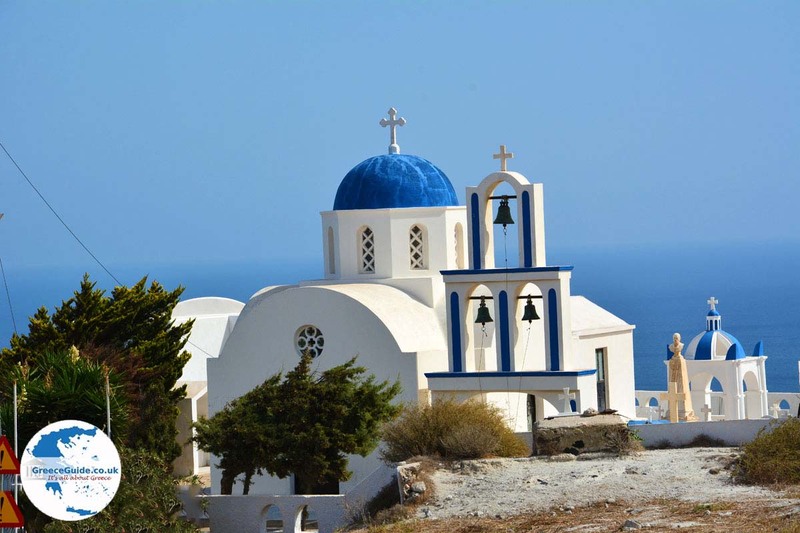 Another attraction is the Church of the Holy Mother Episkopi from the 11th century. During the period from August 1 to 15 there are several festivals in honor of Saint Mary. On September 24, the feast in honor of the Blessed Mother Mirtidiotissa is held. 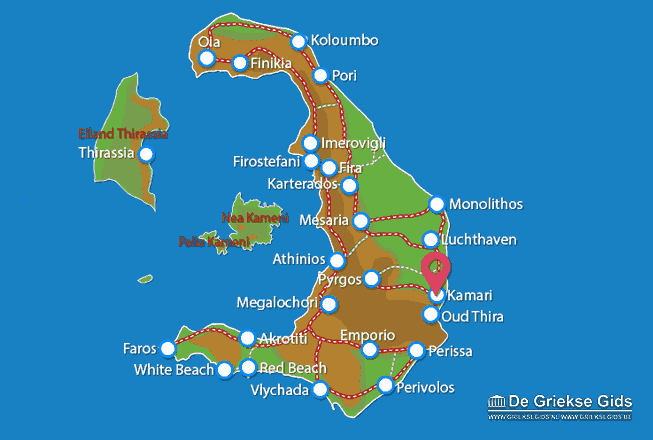 Santorini: Where on the map is Kamari located?